We all are humans and we tend to make mistakes. Blogging is not the exception. Blogging need a deep dedication to make lots of decisions. Some of your decision can be right and some can be wrong. No matter how many times we say that learn from mistakes, still some mistakes we do again and again. Sometimes we have to pay a lot to as the cost of our mistakes. There are millions of blogs online, so competition is always there. To attract huge number of readers, your blog must stand out from the crowd. For this purpose you should follow what we are going to discuss today. Avoiding these mistakes help your blog stand our from the crowd of blogs. 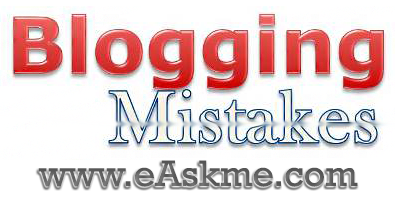 What Common mistakes an Amateur Blogger usually makes? This is the first and very common mistake. If you choose a free domain, considr it your first biggest mistake as free domains usually don`t get exposure.No matter how hard you work on those. Having your own custom domain show professionalism and also it is easy to remember and easy to rank. It is also easy to make brand of a custom doamin. The second main thinsg is design. Whenever anyone visit your site they first notice your design. You blog`s design is the first impression that a visitor find. Newbie blogger do mistake by having a fancy themese with lots of widgets. This don`t lok professional also unnecessary widgets slow down your blog. I also prefer to use a premium theme rather than using a free one. Professional themse provide you support and also easy to customize and free from spam. Also never change theme frequently as it can confuse your readers. Writing articles can be a tedious job for you. It seems really easy to copy someone`s content and paste it on your blog. But result is totally different. Sites with Copy content get marked as spam and get banned. So always write your own artilcles, If you do not have knowledge than read, there is plenty of information on internet. But write verything in your own words.. Always take benefit of already established bloggers, and avoid mistakes. So these are the Amateur Blogger mistakes that bloggers make again and again. If you have any suggestion or add something more feel free to say in comments. If you like this article, don`t forget to share on twitter and Google Plus.